Two pieces of news to report on our ongoing campaign to get a train or tram service to Cheadle. The tram option relies on some technology called tram-train – allowing trams to run on train tracks. It’s been used on the continent for decades, but never in the UK. A tram-train trial service running from Sheffield to Rotherham finally launches to the public today: nearly three years late and five times over budget, but it’s here. We hope this will give the green light for tram-train to be used more widely, and so give us the option of running a tram service along the existing railway lines through Cheadle and Gatley. Secondly, a piece of work by Transport for Greater Manchester (TfGM) on new stations is finally nearing completion, we’re told. TfGM are identifying locations across Greater Manchester for new rail stations. The work was meant to be completed in June, but is only now getting there. We’ve made the case for Cheadle – if it makes it near the top of the list, it increases the chance of getting Government funding in the next few years. Surely, the first tram on the Altrincham line ran on rail tracks. Didn’t it just replace the train? Hi Roger – yes, trams can run on train tracks. The benefit of tram-train is it allows trams and trains to run on the same tracks: light rail, heavy rail and freight sharing the same infrastructure. Thanks for the update, but the immediate priority is an evening bus service from manchester to cheadle, the last one during the week is 1845 and even earlier at weekends, absolutely fed up of having to get trains/tram/taxi etc. Surely there should be a campaign for at least an hourly service. For its size, Cheadle is by far the poorest served area for public transport i’ve ever come across. Shameful. Hi Michael – we continue to campaign for an improved bus service *and* a rail service to Cheadle. Neither are easy – with money being cut, the bus companies only run services where they can make a profit and that’s likely to continue until we have bus regulation in Greater Manchester. At last, TGfM are somewhat belatedly acknowledging the long called for reinstatement of Cheadle (LNW) railway station! This should have been addressed 10 years ago when the Altrincham line was given over to Metrolink and passenger services to Chester were diverted to this route. The line runs through an eminently suitable area for passenger take up with reopened stations at Cheadle, Gatley/ Northenden, Baguley and possibly other locations. Its a ‘no brainer’ – just tell them to get on with it! With regard to trams or tram-trains on this route – forget it. There would be absolutely no advantage but considerable extra complexity and costs. 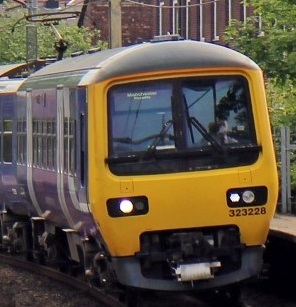 As far as I am aware, this line is still scheduled to be electrified at 25kVac and retained as a very useful part of the national rail network which could carry diesel or electric passenger trains with through services to Manchester and Chester. The existing Metrolink trams run on nominally 750Vdc so that special, dual voltage (more expensive), vehicles would be required. As these would probably be a special small order quantity, the price would certainly be higher than the regular fleet unit cost. Their maintenance costs would be higher too. It is not true to say that trams can share the same infrastructure as heavy-rail trains – without significant modification. Firstly, the wheel-rail interface needs addressing (they’re different) and while not impossible, is not a simple exercise, requiring agreement between different authorities..
Secondly, the loading gauges are dissimilar – as are the platform heights and step distances. These are quite different and would require special retractable steps on vehicles or platforms to meet regulatory requirements. This introduces further complication and expense and possibly reliability issues too. And to what advantage? Heavy rail trains (or railcars) stopping at appropriate stations can travel faster, carry more people and continue their journeys – without a change of system – beyond Altrincham or Stockport. Taking a tram would necessitate passengers changing at each end of the line. I advocate keeping it simple, stay with heavy-rail, the quickest way – with increased frequency if necessary. Hi GB – yes, you’re right on the modifications. That’s what the tram-train trial over in Sheffield has been all about. I don’t want to close off options. If we find a funding stream which is available for light rail but not heavy rail, I won’t be telling the government to take their money elsewhere. I agree totally with GB – heavy-rail is the answer. It covers all options with ease! Don’t worry about doing things for trains, with all the cancellations people will have found alternative ways to travel. A large part of Southern Germany is served by tram-train. It should not be necessary to “Re-invent the wheel”. No doubt the manufacturers who supply that system could supply us too and avoid expensive development costs and short production runs to serve a small part of the UK. I suppose the problem could be that Post-Brexit Britain will go to extraordinary lengths to avoid adopting simple EU solutions. However the pharmaceutical and biotechnology industries realised over 10 years ago that Europe-wide solutions were cheaper and better and included non-EU countries such as Switzerland and Norway in the discussions. I remember this well as a wonderful example of multi-national co-operation that was entirely friendly and constructive – I had the honour to serve on the working party. Decisions were entirely based on practical common sense and there was a complete absence of political point-scoring. Whatever money is offered by government, surely it should be spent in the most efficient and economic way – that is, extending conventional, well-proven technology on a useful part of the existing national rail system. There is no need to spend it on novel projects with attendant risks when the solution to the issue is obvious. I believe there’s a political problem to be solved first…like the GM Mayor getting more economic control over local transport development. And yes, heavy rail would get my vote. A former public health director for Stockport once told me of his dream to have a rail ring around Greater Manchester, which of course would mean replacing jams on the M60 with jams in the carriages. A good idea, despite my cynicism. The more powers we have locally, the better, but it’s still perfectly possible to get the funding from Whitehall. I have also had that discussion with the ex Director of Public Health. I agree its a good idea, but it won’t come in one go – and our section has the strongest financial case. While we are waiting for all this to happen, what about the obvious idea, stated in previous weeks by several contributors, for a circular shuttle bus to take areas having no train service to Manchester, I.e. Cheadle to Parrs Wood tram station, which is a wonderful fast service.